Last week’s post described the challenge of knowing the impact of the law on the delivery of health care in the correctional setting. Knowledge of the law and prisoners’ rights is one of the distinguishing features of correctional nursing practice. This week’s post describes the second challenge correctional nurses encounter which is the patients themselves. There is no denying that our patients have been charged with or convicted of breaking the law, sometimes violently. For the most part, knowing the nature of their crime is irrelevant to the provision of their health care, but it is also true, that offenders tend to think and behave in ways that get them in trouble with the law. These criminogenic thoughts and behaviors pepper a nurse’s interaction with their patients. This is otherwise known as “the Con”, which is defined as the purposeful effort to deceive, manipulate or take advantage of another. Convicts gain respect from others when they “con” someone else and the person who gets conned is considered “weak”. Being weak makes one vulnerable to further exploitation. Correctional nurses describe this as being manipulated. How it often works, is that an offender requests health care attention because of, let’s say, chronic low back pain, for example. In correctional facilities the offender will always be evaluated by a nurse first, who will determine what to do about the request. It may be that with some education, the offender can take care of it themselves, or a nursing intervention may take care for the problem, or finally, the nurse may decide that the offender needs to be seen by another provider and if so will make a referral. Sometimes the offender will ask for something for which there is no objective evidence they need. The offender’s request for a narcotic analgesic to ease the chronic pain in his back, is likely not to be supported by objective findings. The request could simply be that the offender is seeking drugs; it could also be to sell or used to pay back a loan. The offender probably will also ask for an extra mattress or pillow. This also may be used to repay a debt or it could be just an effort to stand apart from others, as having something “special”. This gives rise to another distinguishing feature of correctional nursing practice which is the emphasis on the assessment of objective signs and symptoms and the accuracy of the resulting clinical judgment. Our patients subjective complaint may be embellished and critical details may be withheld (remember the example last week about the inmates who drank printer fluid). The conditions within which our assessments are done, often are not conducive to the patient giving a full and candid account of what led up to the request for care. Erring on the side of leniency in the absence of objective findings can result in being seen as, easy to con, and as word gets around, the nurse will be bombarded with inappropriate requests thereafter. Making the wrong decision though, can also result in harm to the patient. An error in clinical judgment can be because the nurse’s skills are poor or undeveloped, or because the nurse lacks of sufficient knowledge. It can also occur, when a nurse has become cynical about their patient’s criminality and views every request as likely to be devious or untrue. This belief will cloud a nurse’s clinical judgement and important clues to the patient’s condition missed. While they may be manipulative and sometimes untruthful, they have legitimate health care needs as well. So knowledge about the health problems that characterize the population we care for is a critical piece in achieving more accurate clinical judgments. According to a report issued this year by the Bureau of Justice Statistics, forty percent of the incarcerated or detained adult population are diagnosed with a chronic medical condition compared to a third in the general community. Diabetes is twice as prevalent among the correctional population compared to a matched sample in the general community and hypertension is 1 ½ times more common. In terms of communicable disease, TB infection and STDs among offenders in correctional settings are twice the rates in the general community and hepatitis is six times the community rate (Bureau of Justice Statistics 2015 Medical Problems of State and Federal Prisoners and Jail Inmates 2011-12). The racial and ethnic disparities of the criminal justice population are substantial. More than 60 percent are considered racial or ethnic minorities in the general community. One in every three black men and one in every six Latino men will serve time in prison or jail during their lifetime, compared to one in 17 white men. The same racial and ethnic disparities exist among women; one in every 18 black women and one of every 45 Latina women will be incarcerated in their lifetime compared to one of every 111 white women (The Sentencing Project at http://www.sentencingproject.org/template/page.cfm?id=107). There are age and gender disparities among the incarcerated population as well. The overwhelming majority are men and they are relatively young in age. While women are in a minority, representing only 9% of all incarcerated persons, their population is increasing at much faster rates than men. 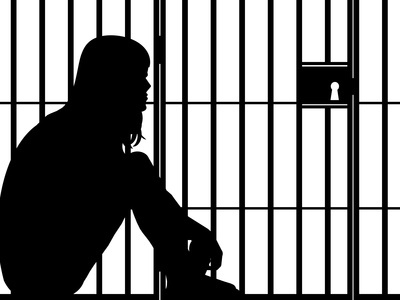 Incarcerated women have high rates of traumatic history, particularly child abuse and domestic violence; their convictions are usually drug or drug related and most also are responsible for raising children (Bloom, Owen & Covington 2005). Older prisoners also are a small percentage of the total (8%) incarcerated population but their numbers are growing at much faster rates because of mandatory sentencing and increasing numbers of extremely long sentences received. In fact the population of prisoners over the age of 65 increased 63% compared to a 0.7% growth for all other ages between 2007 -2010 (Human Rights Watch (2012) Old Behind Bars at https://www.hrw.org/report/2012/01/27/old-behind-bars/aging-prison-population-united-states). Juveniles are another small but important group, with unique health care needs. They represent less than 1% of all persons incarcerated. Although incarceration rates for youth are declining, we know that incarceration decreases the likelihood of high school graduation and increases the likelihood of subsequent incarceration as an adult (The Hamilton Project 2014 at www.hamiltonproject.org). What these statistics mean is that correctional nurses provide population-based health care. Nurses must be knowledgeable and vigilant in their clinical judgement, in order to identify and appropriately treat the health conditions that occur more frequently within each of these population subgroups (blacks, Latinos, women, children and the elderly). This focus on the uniqueness of each individual conflicts with one of the major norms of the correctional system; that incarceration is done to deprive a person of their individuality. No one gets special treatment, no one can be singled out and the rules are applied to all, firmly, fairly and consistently. This norm about uniformity among prisoners, conflicts with the expectation and science of patient-centered care. Yet when individualization is in the best medical interests of the patient, correctional nurses are obligated to speak up. Patient advocacy, therefore is another distinguishing feature of correctional nursing. Often the nurse will have to act alone because they are the only health care provider at the scene. An example of nursing advocacy for the individual needs of patients is shackling. Shackling is a security measure to prevent escape when prisoners are taken outside the confines of a correctional institution. In some correctional facilities or systems this is a routine practice applied to all, even pregnant women during labor and delivery. The American Medical Association, the American Public Health Association and the American College of Obstetricians and Gynecologists have each decried this as an unsafe and potentially harmful practice. Some states have even passed legislation prohibiting the use of shackles during labor and delivery. And yet we know the practice continues, so it often is the individual nurse who must insist the shackles be removed for the sake of the patient and their care. In addition to knowledge, vigilance and advocacy for the needs of the population served, correctional nurses must be generalists in their competency to provide all types of nursing care. Like the prisoners themselves, who are not being able to choose their provider, correctional nurses do not get to choose their patients. A friend of mine and author of one of the chapters in our Essentials text, Roseann Harmon, tells a story about one of her first experiences in correctional nursing. She had been hired at the county jail because she had mental health experience. One evening the nurse manager came to her and said “Roseann, we have a woman out in the squad car at intake and she is in active labor. I am going to need your help because we are the only ones close by. Will you go get the OB pack?” Roseann gulped and said, “But I’m the mental health nurse, not an OB nurse.” The manager responded, “Well you are a nurse and so am I. We are the only ones here right now so we have to respond and we will do it together. This woman needs us.” Well, Roseann survived this experience and still tells the story years later, reminding us not to let our general nursing expertise diminish. The second part of the ANA’s definition of correctional nursing is that the population cared for are prisoners. To summarize our population is characterized by criminality; ethnic, racial and gender disparities and has a high burden of disease. This population has had little in the way of regular health care prior to incarceration and are illiterate about self-care and health generally. Correctional nursing is defined as being responsive to the health care needs of people during their incarceration. What are the best ways to maintain your knowledge and competencies as a generalist in nursing practices when there are some many changes in the science and best practices of health care? Please share your thoughts and resources that you think help nurses stay current in our field by responding in the comments section of this post. If you would like to read more about the health care challenges and characteristics of the incarcerated population, see many chapters in our book, Essentials of Correctional Nursing, devoted to the nursing care of women, juveniles, the elderly, the racial and cultural groups as well as those with chronic disease and mental illness. Order a copy directly from the publisher or from Amazon today! This entry was posted in Professional Practice, Scope and Standards of Practice and tagged American Nurses Association, ANA, Catherine Knox, Chronic Care, correctional nursing, Essentials of Correctional Nursing, Female Inmates, health disparities, jail nurse, prison nurse, Scope of practice, Standards of Practice. Bookmark the permalink. Thanks Catherine for a very good article about the challenges. There are many and you highlighted the most critical and the ones that can effect patient care and also can result in risk if skills are not maintained.